Automated moisture test and grammage determination for web-shaped materials in compact product lines, i.e. decorative paper, foil, impregnated paper. The more commonly known model, VenScan LMS, is already well approved, based on the exact and reliable microwave measuring technology for grammage and moisture testing systems. 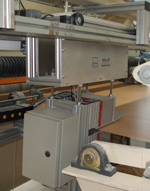 For an application in smaller and tighter product lines the linear motion units as well as the sensor have been essentially minimized.